As you may know, I have a real problem with those in my industry who tell investors to literally ‘do nothing’ as they watch their life savings disappear into thin air. 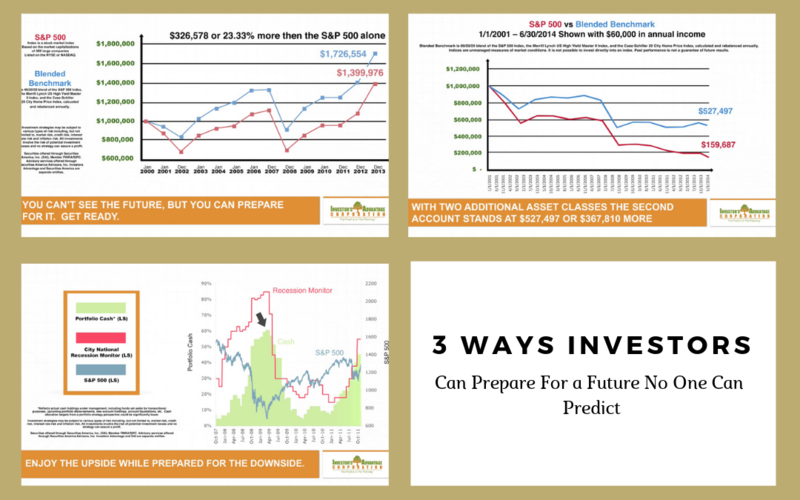 No matter where we are in the world or where our money might be at a given time it makes a great deal of sense to prepare in advance your exit strategy in the event of real and present danger. This is not a recommendation, but it is an easy example from which every investor can learn. It’s a 1-2 punch to keep you from getting your assets handed to you. Slide 1. Notice how a traditional buy and hold in stocks did well and how an investor who owned two additional asset classes did better. The decline wasn’t as severe in 2000-02 and 2008-09. If your account held up better than most the last two times in the same decade markets were off 50% your portfolio may hold up better the next time the grits hit the pan. Slide 2. 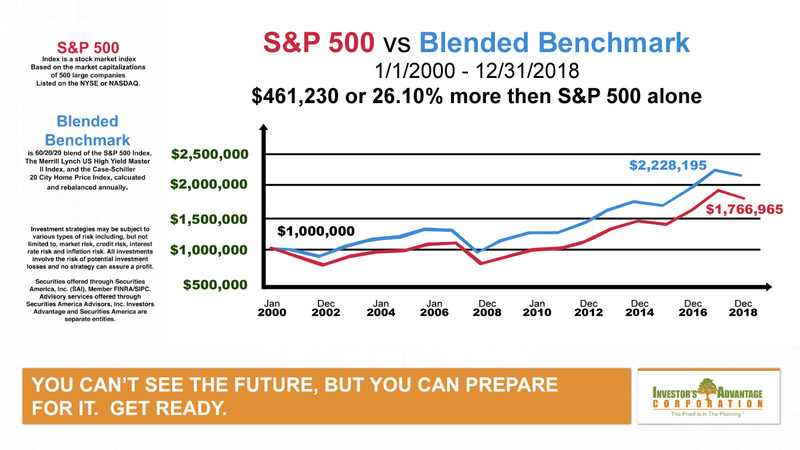 In the second scenario we show what happened when the investor needed to withdraw $60,000 a year from their retirement balance of $1,000,000 the beginning of 2001. In both cases over $600,000 was withdrawn, but the portfolio with three asset classes held up better than the investor with only one type of investment vehicle. We can agree that three legs supporting your life savings is better than one. Active Management systems can work like a thermostat to determine daily, is the call risk off or risk on? Slide 3. As the Recession Monitor shown in red went north and stocks in blue went south, shares of stocks were sold to reduce losses. 2008 started with 5% of the portfolio in cash or money markets, shown in green, but you can see at the black arrow client money market accounts expanded to 60% of their account. 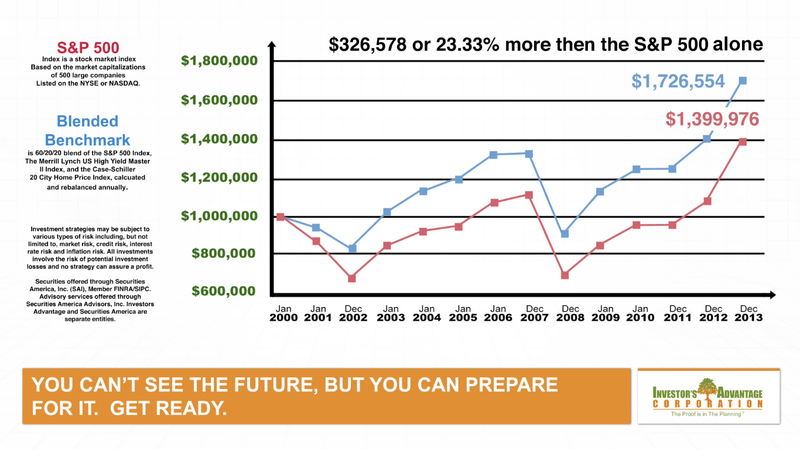 Think risk off in 2008 as the markets had every investor running for cover. Think risk on in 2009 when negative volatility turned positive. 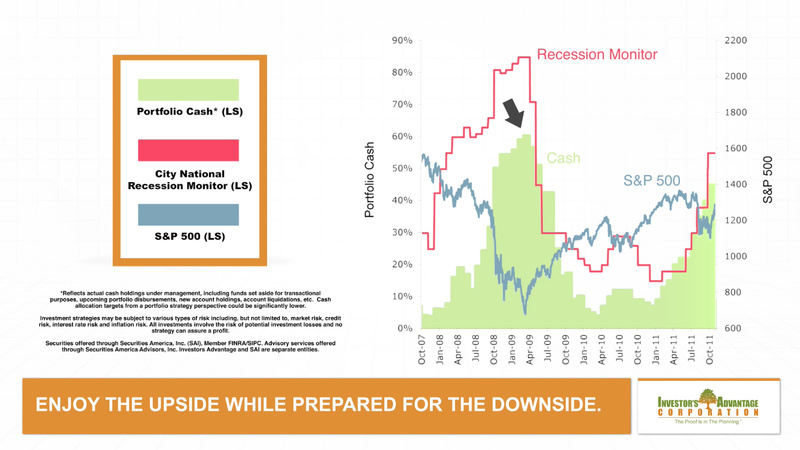 Over time you can see that the percentage of cash moved back to 5% when the market gained its footing. Investors deserve to employ teams that look at their accounts daily to determine is it time to pour more fuel on the fire in an upmarket or water on the fire during severe downturns.